Peter has a wide knowledge of Organic Gardening and is Chairman of the Shropshire Organic Gardeners Society (SOGS). He talked on all aspects of the subject of Organic Gardening encouraging the audience to ask questions that take the subject in any direction. 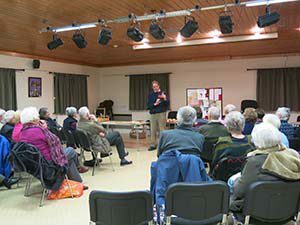 Peter engaged the audience in his presentation on organic gardening. 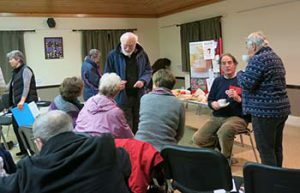 The result was an interactive debate on a variety of gardening topics, including what exactly is organic gardening, composting-how to stop the weeds, and the merits or otherwise of digging or even double digging. 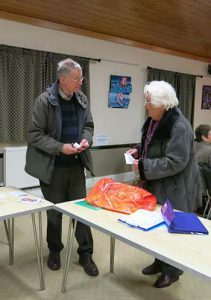 Peter was as interested to hear our views and experiences as we were to hear about his To augment his talk Peter brought along a number of “aides memoire” , ranging from books, comfrey feed and produce from his garden to help to keep the range of topics a wide as possible. If you think January has little to offer food wise in the garden, we were made to think again as Peter had a list of 40 plants, including herbs, vegetables and even so-called weeds that he had noted in his garden earlier in the day. Perhaps we haven’t got as many, but possibly more than we thought! 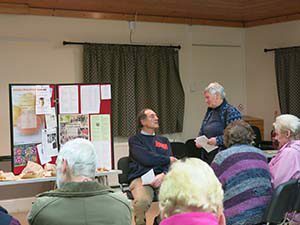 Many members are now likely to re-consider some of their gardening activities following Peter’s entertaining and informative presentation. Some photos of the meeting are shown below.